OLM to MBOX Converter for Mac from USL Software, offering suitable functionalities (like batch conversion and Unicode text conversion) and a favorite interface making the job extremely easy. Looking for an OLM to MBOX converter for Mac? You came to the perfect place. But before we go ahead and reveal the most effective software for converting OLM files to MBOX, you need to know certain things. Why Most OLM to MBOX Converter for Mac don’t work? OLM and MBOX are data files, and quite contrasting to each other. They have literally no similarity in terms of the framework and how they store data inside themselves. Where OLM is used by Mac Outlook, MBOX is used by Mac Mail, although MBOX is more generic and is now become a standard data file for many purposes. Nevertheless, the fact remains that to extract and convert data involving these files is quite demanding. It requires some of the sophisticated logic that can interact with the complexities involved with data files and you need to perform the entire job using a professional tool otherwise it can go downhill pretty quickly. What About Manual OLM to MBOX Conversion methods? Sometimes people recommend renaming the OLM files to MBOX by simply changing the suffix or file name extensions. That doesn’t work. Other approach is to drag the folders from Mac Outlook to other locations like your Mac desktop. This converts the files into MBOX. But for anything more than folder or a single folder of large size, this is not practical. There are plenty of limitations and annoyances associated with this method. You can’t transfer your emails or contacts this way. Outlook for Mac can even truncate the messages or other elements if the folder is larger than 2.5GB and dozens of other issues. There’s also IMAP transfer method where you can use a dummy email server as a middle-man to move emails, contacts etc from Mac Outlook to Apple Mail using synchronization through IMAP protocol. Again, it works for few emails, but is highly impractical for anything more than two folders. It requires high bandwidth and even then, can often result with incorrect output. 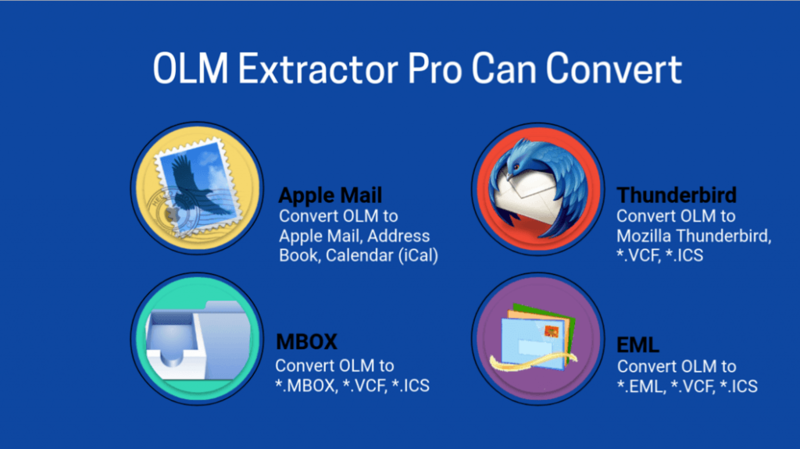 Try “OLM Extractor Pro” – the Best OLM to MBOX Converter for Mac! Finally, you are going to get the good news. “OLM Extractor Pro” from USL Software brings a surprisingly flawless approach to an otherwise difficult process (as explained above). Whatever problems you expect during OLM to MBOX conversion is avoided if you use “OLM Extractor Pro.” Built with modern data-extraction processing logic and deep-scan algorithms, it offers exhaustive data conversion without missing any data file or metadata. It also features a simple GUI that a beginner can use easily. Other features like batch conversion, support for non-English text, and 24×7 customer support truly makes it the best answer to a problem that has been troubling many since years. Try it now at https://www.olmextractorpro.com/. Download the OLM to MBOX Converter for Mac trial setup from above link.